During Thanksgiving break (Nov. 19th-26th), my wife Anita and I took our first trip to Italy. We stayed in Venice, Florence, and Rome, taking in everything we could from Michelangelo's David to the Sistine Chapel. There's a lot more to do in Italy than even a week-long trip could offer, but we did take some time out to do some shopping. After doing some research, I was able to hunt down a couple of game stores. I wanted to see what my hobby was like in a foreign country, and track down something authentic (or at the very least, something in Italian). I had found several but only had time for two. We explored the shops, took some photos, spoke to the owners/employees, and of course purchased some games. * Here's what we found, and what I took home with me. 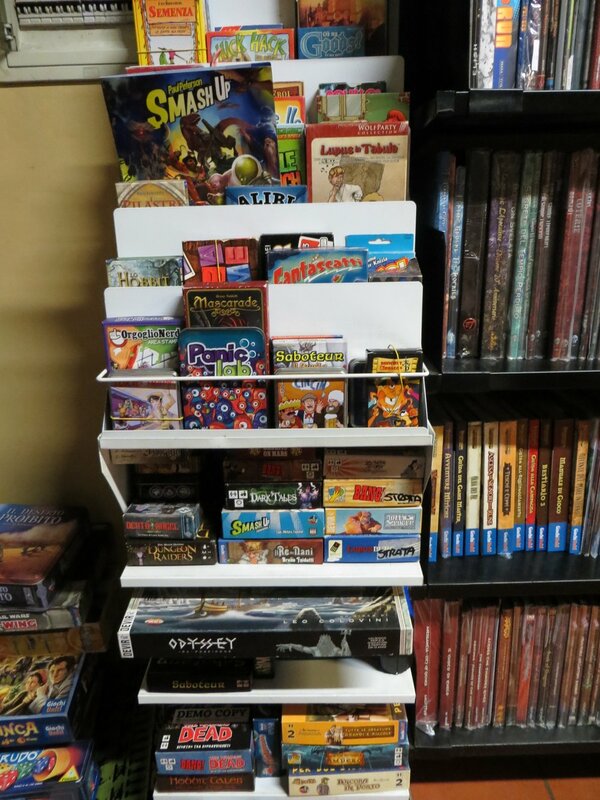 *I believe that it's good practice to at least try to make a purchase at a local game store that you're visiting out of town. Or in this case, out of continent. In Florence, we stayed at a hotel facing Florence Cathedral, or Il Duomo. This massive church is the dominant structure in the city, and Florence seems to spread out from its location. 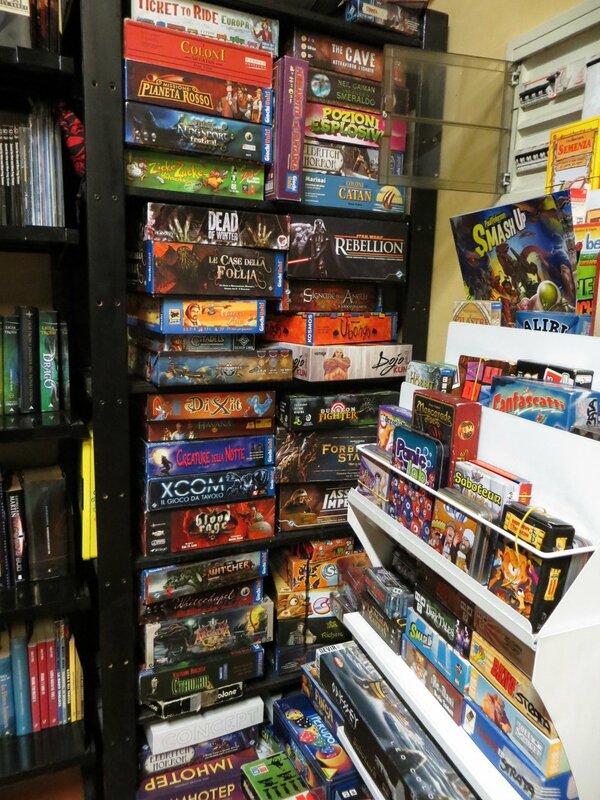 Not 20 meters away tucked on one of the many winding side-streets near the Duomo lies Stratagemma, a store catering to geek culture that's filled to bursting with board and card games, roleplaying books, painted miniatures, toys, statues, and an impressive variety of memorabilia. 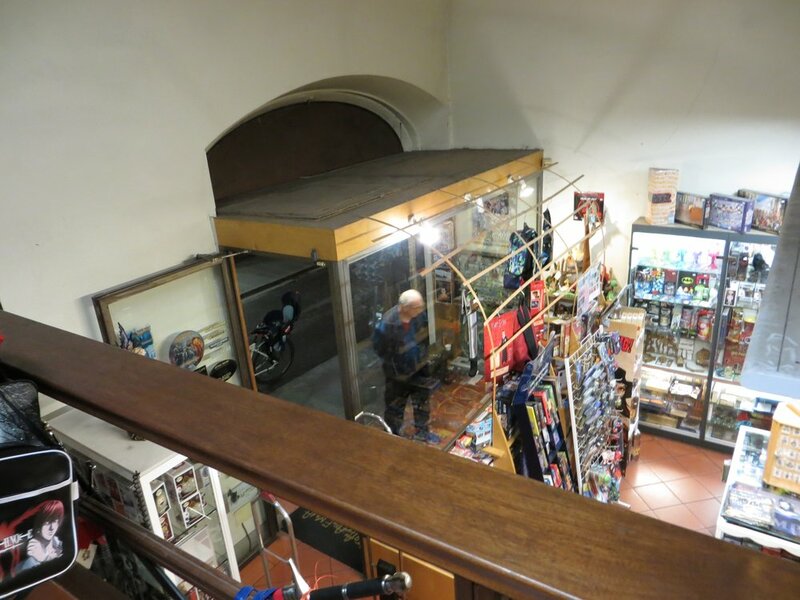 Inside the main entrance was a small staircase that led to a balcony above the checkout counter, filled with even more games. In the back was a section where you could demo titles (all in Italian, of course), and another large room where some of the employees and guests were painting miniatures. Most of the games I saw were familiar ones translated into Italian. My goal at the time was to either get a game that I was familiar with but could get in Italian, or to find a game that was created or published in Italy. I only spoke to the employees here for a moment, but I ended up purchasing a copy of BANG! : The Dice Game, which had its own display case. BANG! : The Dice Game was created by two German designers, but is is based off the original game BANG! designed by Italian game creator Emiliano Sciarra and published by the Italian company dV Giochi. It is also widely available in the U.S., and I highly recommend it as a light party game. 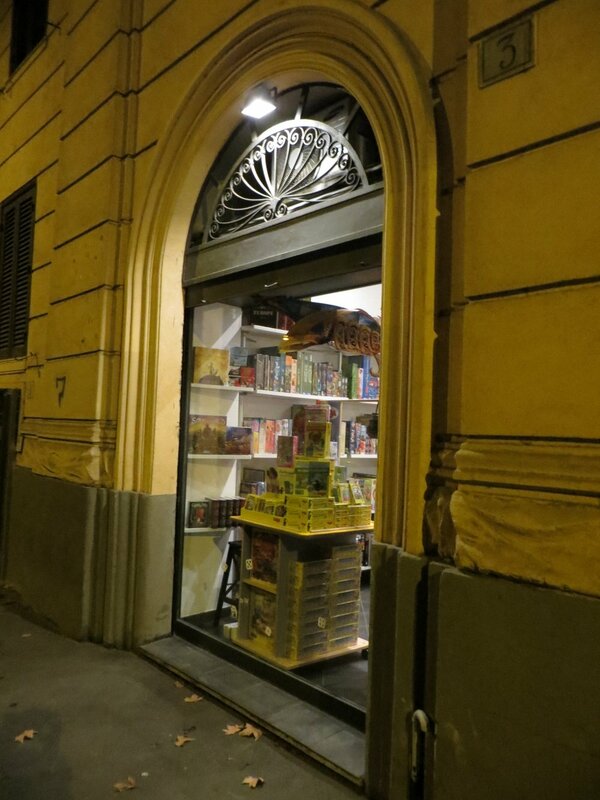 Rome has several game stores, and I would have visited more of them (such as Strategia e Tattica 2), but due to time constraints and our location, I had to settle for just one. 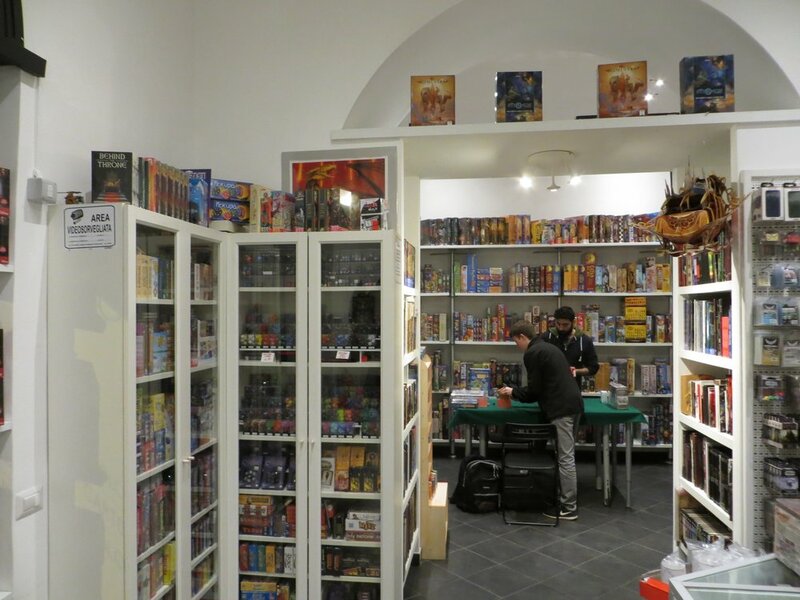 So the evening before we were flying back home, I took a cab to Piazza del Risorgimento near the walls of Vatican City and walked to Avalon Roma, a small but jam-packed gaming shop just 10 minutes north of the Vatican. Avalon Roma is definitely one of the nicest and cleanest gaming shops I have seen. They have two windows that look out on to the street, not far from a very busy shopping area. 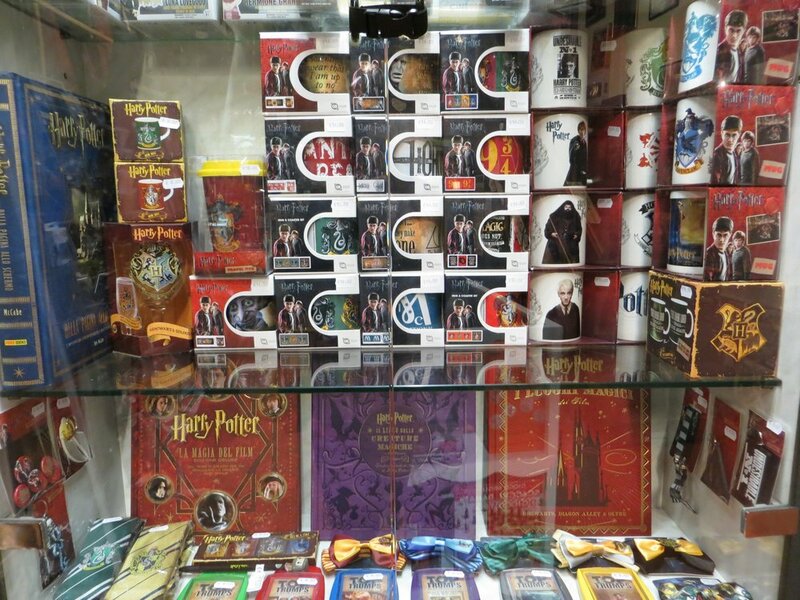 There walls are covered with games, books, cards, and display cases, and there was a table set up where two employees were playing Magic. The staff was very friendly, and I told them I was looking for a game that was made in Italy. The staff member who helped me (whose name escapes me at the moment, but he was a very friendly and informative gentleman with a beard) took the time to ask me what games I enjoyed and showed me several, and after some discussion and comparison I went with two titles from publisher Red Glove. The first game I was shown was the party game Vudù. Each player plays "curses" on the others, forcing them to do ridiculous things like cluck like a chicken, or not let their feet touch the floor. The version I picked up is in English, but that would probably be preferrable for this type of game. The second game came highly recommended, and I was told it was one of their best sellers. Rush & Bash is a racing game in the style of Mario Kart, where players control drivers that shoot projectiles and drop hazards on the tracks. It looks like the sort of game that would do well with a larger group of players, and has a lot of variety in terms of racers and courses. Both Rush & Bash and Vudù appear to be unavailable in the United States at the moment, but I believe Rush & Bash was picked up by a North American distributor not too long ago. I'd recommend checking it out if you can get your hands on a copy. I ended my discussions at Avalon Roma by asking about Italian game conventions. Did they have anything similar to the enormous Essen Game Fair held annually in Germany? Turns out there is! Around the same time of the year as Essen (late October), the city of Lucca in Tuscany hosts the Lucca Comics & Games convention, the largest comics convention in Europe. So yes, an enormous comics and gaming convention in a Medieval-walled city in Tuscany during autumn. I might need to book another flight.